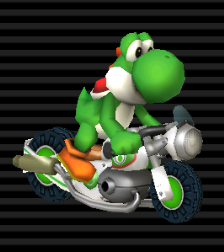 The Sneakster (known as Nitrocycle in Europe and Oceania) is a medium-sized bike in Mario Kart Wii. It looks similar to a stretched-out old Harley. The character's emblem is located at the very back of the bike as well as underneath the handle bars. It is unlocked by getting a one-star rank or better on all 100cc Wii Grand Prix cups. Its kart counterpart is the Sprinter. In addition, it is also similar to the Spear, in which both are the fastest bike in their respective classes. The Sneakster is the fastest medium bike in the game, tying with the Flame Flyer, a heavyweight kart. It also has average weight (tied with the Super Blooper) and drift, but is actually the second heaviest medium bike in the game. Its other stats are quite low and its acceleration is equivalent to that of the Shooting Star, Mini Beast, and Piranha Prowler. Its off-road stat is tied with the Honeycoupe and the Wild Wing. "If you take a look at the Sneakster's stats you'll notice one thing: awesome top Speed. It's one of the fastest in the game. Naturally, that Speed comes at a high cost, as all other categories have far lower stats..."
Diddy Kong drove this bike for the first August 2008 tournament, as well as the second December 2009 tournament. In Mario Kart 8, a bike called the "Comet" is similar to the Sneakster. It's also an inside-drifting bike. This page was last edited on March 4, 2019, at 17:52.